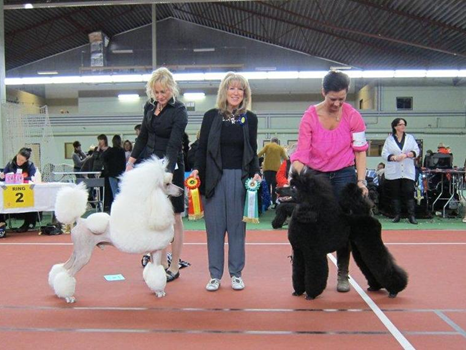 2x BIS at Swedish Poodle Club Show in Gnesta!!! Yesteday we had a great day at the Swedish Poodle Club show in Gnesta. It was only 1 hour from home. The judge for the Standard Poodles and the Puppies was Breed Specialist Mrs Lynn Cambell, UK and the small Varieties was Mrs Jackie Kitchener, breeder of Miniature Poodles in the UK. For the first time we showed Simon and Siris daughter Bibbi, Huffish Miss Pretty Woman. She just turned 4 months old. She got BOB and BIS puppie. She really loves everything that happens, wants to kiss all people who looks at her. The judge and some other people wanted to take her home but she is already loved by the owners Kerstin and Willy Sörquist that also has Bibbis mother Siri, they wouldn’t be happy if I sold her again.. I also took our Wildcard, Tia out for the first time. Cotian Tatianna. Tia is bred by Mrs Debbie Cozart in Australia and very close related to our lovely, Ch Diego Da Maya. Tia was in Juniorclass and she also loved to be at the show and got all the attention. She won the class and ended up with the CAC and Best Female, followed by our homebred Huffish Streets of Joy, Klara. Freddie helped to handle her very nicely. Congratulations to her owners Cathrine and Kenneth Dahlström which I am sure this was not their last show with Klara after the great result. Klara is a littersister to Adam and Lex. 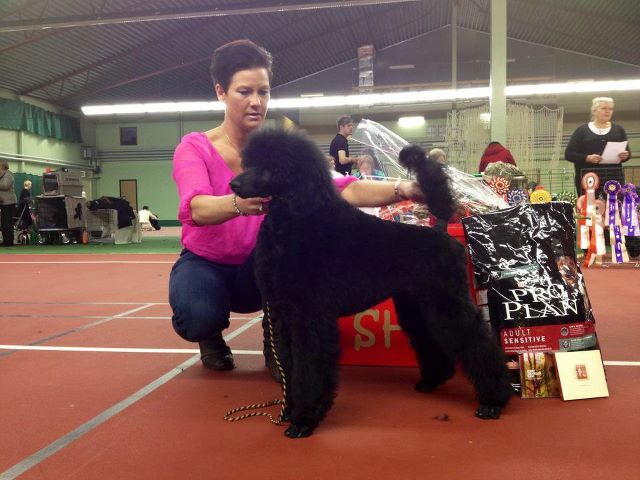 One of my best friend Maria Modig got the BOB and the Swedish Championtitle with her American Import Ch. Kaylen´s The Piano Man “Billy”. ← Tia and Boss hips are A!!! !